Already a proven player in the WNBL and SEABL, Blicavs has already added to her national achievements as a younger player. From a sporting family that includes mother Karen (selected for the 1984 Olympics), father Andris (represented Australia at 1976 Olympics) and brother Mark (AFL footballer), Blicavs has the pedigree to become a star of the Opals. In a limited role initially at the AIS, several injuries to the team suddenly thrust Blicavs into the limelight and her performance under pressure saw the Dandenong Rangers scoop her up as soon as was possible. After averaging double-figures in the 2011-12 season, she scored 19 points on debut for the Rangers. A move to Bendigo in 2013 has seen her surpass 100 WNBL games while her field goal percentage has consistently hung around 40% her entire career. At SEABL level, Blicavs has found a home at Geelong after playing with Launceston in 2012 where she averaged 21 points per game. Through the 2015 season, the combination guard/forward was one of just five players averaging a double-double. 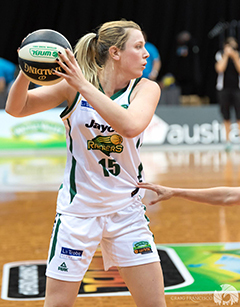 Blicavs was a member of the Opals which qualified for the 2016 Summer Olympic Games, after winning the 2015 FIBA Oceania Championship against the New Zealand and she went on to help the Opals win a silver medal at the FIBA Women's Asia Cup.